Lyme disease is caused by being bit by infected ticks, most often in their nymphal or immature form. Nymphs are about the size of poppy seeds, and because their bites are painless, many people don’t realize that they have been bitten. Avoid areas where they are typically found, including leaves, logs, and long grasses. Dress in light-colored clothing that contrasts with the tick’s color, and seal off vulnerable access points by tucking your shirt into your pants, and pants into your socks. Talk with your pharmacist about DEET protection on your skin and clothing. 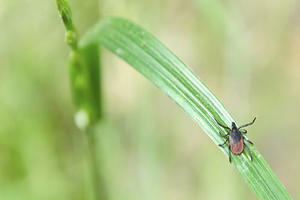 Always do a thorough check for ticks after possible exposure—on your body, clothing, and bedding. Use fine-pointed tweezers and grasp the tick as close to the skin as possible. Pull straight out with steady pressure, avoiding squeezing and “breaking” it. Wash and disinfect your hands and the area around the bite. Package the tick in a small plastic bag with a moist piece of tissue or a leaf, label and date it, and have a lab or vet identify and test the tick for you.